Here are a few questions we're asked all the time. We'll be adding to this list shortly. What components do I need for a Solar Hybrid system? What can a Selectronic Certified inverter do for my Grid Tied system? When I am trying to choose a myGrid kit, how do I know to use the C10 or C100 battery rating? Can I use LiFePO4 (Lithium) batteries with a SP PRO? Is the Selectronic SP PRO compatible with Tesla Powerwall? What is the difference between a standard ABB or Fronius inverter and a Selectronic Certified version? Are the myGrid kits suitable for 3 phase systems? Can I add a backup generator to a Hybrid system? When should I use Managed AC Coupling? So is the SP PRO and OFF Grid Inverter or ON Grid? AC Coupling or DC Coupling, which is best? Why do I need a solar controller in a Grid Tie system. Does the SP PRO have its own inbuilt Solar Controller? What kind of Solar Controller can I use with my SP PRO? Is the SP PRO really made in Australia? What is a Selectronic Accredited Integrator? What is a current shunt? Do I install current shunts in the battery positive or negative lead? Where in the negative lead do I install currents shunts? Do I need to zero the current shunt reading once installed? Do I need a current shunt with an AC coupled system? Do I need to connect Battery Sense wires? Can I connect the Battery Sense wiring without the mid-point as well? We have developed the STELLA solar storage calculator to help you determine the right Selectronic components for your Solar Hybrid system and to model the basic performance of that system. Use STELLA to help you understand how adding battery storage to a solar power system will impact your use of grid electricity. Store excess solar instead of sending it to the grid. Minimise grid use during high Tariff costs. A batteries capacity will be rated at a particular charge/discharge rate, expressed as C X, where X is the number of hours it will take to discharge or charge the battery. The faster you discharge a battery, the smaller the capacity. As an example, in a Solar Hybrid System, you may want to use your stored energy between when the sun has gone down and before the sun comes up next day, this may be a period of 12 hours or so, so in this case using the C10 rate would be more appropriate than the C100 rate. Choose the closest C rating to how you will really use the system. For most Solar Hybrid systems, C10 is the correct choice. The SP PRO has LiFePO4 as a default battery type in the configuration settings. These defaults can be used as a safe group of settings for Lithium batteries or you may use custom settings if you are an advanced installer. The default settings can be used when the Lithium battery does not require communications between the inverter and the batteries’ Battery Management System (BMS), such as SimpliPhi or Gen Z.
Lithium batteries that require communications between the inverter and battery will require a custom setting for that particular battery. The SP PRO now has default settings for LG Chem batteries. Other batteries will follow. The Tesla battery system is a 350-450V DC Lithium battery that is only suited for connection to high voltage grid-connected solar systems. At this stage Selectronic do not have a high voltage inverter for compatibility to Tesla. Our SP PRO battery inverters are available in 24V, 48V and 120V DC inputs. Selected single phase ABB or Fronius grid-tie inverters can be supplied through the Selectronic distribution channel as compatible with our managed AC Coupling technology. This is required where the solar needs to be controlled, such as in export limited Solar Hybrid applications or Off-Grid systems. Energy output from the Selectronic Certified ABB or Fronius will be controlled in as fine as 0.1% steps. Selectronic Certified means it is guaranteed to operate as required with the SP PRO battery inverter and comes complete with the hardware required to easily connect the two together. If you are adding battery storage to an existing grid tie system with an ABB or Fronius inverter already installed, then there is no need to update these to a Selectronic Certified version, unless the total amount of solar generated energy exceeds the export limit (zero on an Off-Grid system). The myGrid kits are only suitable for single phase systems due to the rating of the battery isolator. With the addition of our Grid Fail Generator Backup module installed inside the SP PRO, a backup generator can provide system support if the batteries become depleted during a grid outage. When the grid fails, solar and batteries will run the load. If the batteries become too depleted then the generator will automatically start. Note: Suitable for auto start generators only. Suitable for 24V and 48V systems only. Not yet available for three phase systems. AC Coupling is a method of inserting Solar into a battery based system via the AC circuit rather than the traditional DC Circuit. To do this, a standard Grid Tie inverter is used to turn the high voltage DC from the Solar Panels into AC Electricity. AC Coupling is highly efficient for “Self Consuming” Solar Power. There are two methods of AC Coupling. 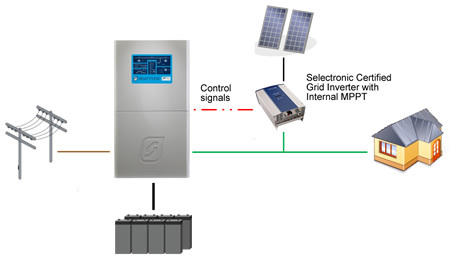 Communications between the battery based SP PRO and the Selectronic Certified Grid Inverter allow precise control over the amount of Solar output. This is particularly important if Grid Feed Export is limited or not allowed or with an Off Grid system. For more detail, see Managed AC Coupling. This is suitable for On Grid systems only. 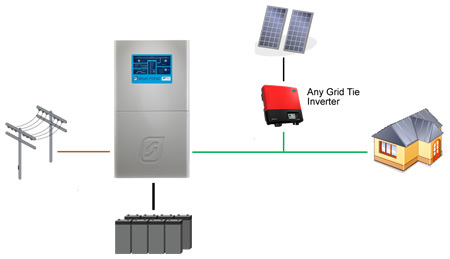 Any grid tie inverter is connected to the Load side of the battery based SP PRO but cannot be controlled, so is not suitable for Off Grid systems or Grid Systems where the Solar array is larger than the export allowance to the grid. DC Coupling is the traditional method of inserting Solar into a battery based system via the DC circuit. To achieve this, a Solar Controller or Maximum Power Point Tracker (MPPT) is wired between the Solar Panels and the battery. DC Coupling is highly efficient for charging batteries. Managed AC Coupling provides precise control over the Solar Output. This is required for Off Grid systems. For On Grid Solar Hybrid systems, whenever the size of your Solar Array is higher than the amount you are allowed to export then you must use Managed AC Coupling. So is the SP PRO an OFF Grid Inverter or ON Grid? Due to the incredible programming flexibility of the SP PRO it can work equally as well in both modes, either operating in a Stand Alone system where there is no mains power available or in a battery based grid connect system. You can choose which option you prefer at time of installation. SP PROs can work in either situation, or a combination of both. DC Coupling is where the Renewable Energy charging source is injected directly onto the DC Bus, the hardware required to do this is generally a little cheaper. The efficiency when charging the battery will be maximised using DC Coupling as there is only the Solar Controller in series with the charging. If this is a grid tie system the maximum power that can be exported to the grid is equal to the rating of the SP PRO. AC Coupling is when the Renewable Energy source (mainly Solar) is connected directly to the AC Bus (SP PRO output) through a Selectronic Certified grid tie inverter. Installation will be quicker and cheaper with this method as the solar panels can be wired at up to 600V DC open circuit. Today’s solar panels generally have MC connectors, which make connecting multiple solar panels in series very easy. Efficiency will be maximised when AC Loads are present during sunlight hours as the PV energy will go directly to the load. AC Coupling can also run higher loads during the day as the output from the grid tie inverters and the SP PRO inverter can be added together. The grid tie inverters can be installed up to 100m away from the SP PRO allowing the PV to be placed exactly where you need it and then run efficient AC cabling back to the AC Bus. If this is a grid tie system, the maximum power that can be exported to the grid is twice the rating of the SP PRO, with a maximum number of five Selectronic Certified grid tie Inverters. The SP PRO will continue operating when the grid has failed, however if the batteries are full and the load is satisfied then the additional PV energy must be controlled to ensure batteries do not become overcharged; this is the job of the solar controller. future expansion of the installed solar of other renewable energy. What kind of Solar Controller can I use with my SP PRO. If you are using thje DC Coupled method then you can use any type of Solar Controller you wish; series control, MPPT or other. These will work independent of the SP PRO but a current shunt must be installed in the DC negative of the controller. The current shunt allows the SP PRO to read the DC current and accurately calculate State Of Charge of the batteries. If you are using the AC Coupling method in a Grid Tie Battery Backup (Solar Hybrid) system, then any grid tie inverter can be used. 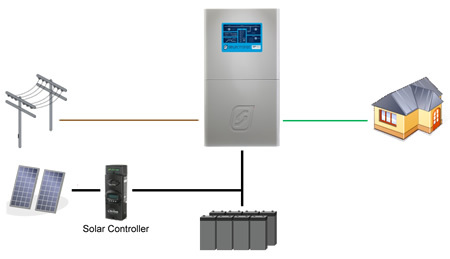 The SP PRO will use the grid tie inverter as a solar controller using our Generic Inverter Control. Only a Selectronic Certified grid inverter can be used in a Stand Alone Off Grid system when using the AC Coupled method. Absolutely! Selectronic have their headquarters in Chirnside Park, Victoria Australia. In this building we design the products, we build the products and we service and sell from here also. Some subassemblies come in from interstate and the Transformer is from overseas, but otherwise everything else in manufactured in Melbourne, and has been since our first inverter in 1981. Selectronic Accredited Installers have undergone comprehensive training and assessment, covering product design features, system integration, installation and field servicing of Selectronic inverters and have greater understanding of how Selectronic inverters operate and interact with other components in a power system. A Selectronic Accredited Installer will correctly integrate and install your Selectronic inverter to ensure its optimum performance in your power system. Read more about the benefits of using a Selectronic Accredited Integrator. A current shunt is a high current, low resistance, resistor which is placed in series with the current flow to allow external devices to measure the current. Each current shunt will be calibrated to drop a certain voltage in relation to the current. E.g. when a 100A/50mV current shunt has 10 mV across it, then the current will be read as 20 Amps. Current shunts are only used in DC circuits. The current shunts must be installed in the battery negative lead only. If current shunts are placed in the positive lead this may cause damage to the inverter. The SP PRO can allow 2 external current shunts. No current shunt is required to measure the SP PRO’s current. If a shunt is being used for a charging source eg, Solar, Wind or Hydro, the current shunt must be placed between the regulating device and the battery. If a current shunt is placed between the charge source and the regulating device, then the current reading may be incorrect. Yes, there are “Zero Shunt” buttons in the SP LINK software's Service Settings. Ensure that no current is flowing through the shunt and press the button. The SP PRO will ignore any request to zero if more than 5mV is detected. No. The SP PRO measures the battery current internally and because the AC coupled power is charging the battery via the SP PRO, no current shunt is required. No, but it is highly recommended. If you choose not to install the sense wiring, then the supplied link wires must be fitted to clear the Service Required alarm. Yes, the midpoint detection will automatically de-activate if measured levels are unrealistic.